I love getting new shoes, boots and purses. I guess most women do. I could seriously have an entire of closet of shoes. I don't have that. But I could. Elli and I recently walked into Nordstrom's. The Ladies shoe department is the first thing you see when you walk in the door. And on the very first table were a pair of boots that had my name all over them. "Ooooooooh. Look at these boots!!!" Elli and I picked them up, and looked at how beautiful they were. Then we flipped them over to see the price. YOWZER! They were around nine hundred bucks!!! Really?? It's all because of the name. Prada. Immediate sadness. I will never have these boots. There was another woman in the store who's daughter was also eyeing the boots. I jokingly made a suggestion to her that we could buy them together and share the boots. She laughed. I don't think her daughter is getting the boots either. Boo hoo for us. I tried to find the exact price on the Nordstrom website. But guess what? When I type in Prada all they have are fragrances. No shoes. No boots. Hmmm? So I google it. I can't find the exact boots anywhere. 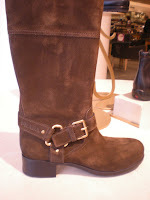 Neiman's has a ton of Prada shoes and boots. They're all expensive. And really cool, too, I might add. Here's the thing. As you can see, the boots aren't fancy. They're suede. They have a cool buckle. And they're probably made just like any other boot. So why the huge price tag? They're Prada. Prada can charge whatever they want. Maybe they'll come out with Prada II or Prada light. With lighter, cheaper price tags for us regular folks who like their stuff but are not jazillionaires. Prada? Are you listening? Are you out there? Hello???? I think you should go into the business of designing knock-offs of designer wear at affordable prices. You're so good at knowing what's hot and what's not that people like ME need people like YOU to figure out how to create look-a-likes in MY KIND OF STORES.......you know, like Kohls! LOL!